Author M.M. 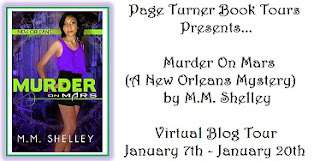 Shelley: Virtual Tour! Murder on Mars a New Orleans Mystery will be going on a virtual tour with Page Turner Book Tours begining January 7th. There will be a lot of fun stops along the way! 8th January 2013 - Spellbingings - Guest Post: What should a visitor to New Orleans see and do? 14th January 2013 - Horsham Writers - Guest Post: What does 2013 hold for you as an author? Murder on Mars Book Tour!